A look into the world of big data and how its shaping almost every facet of our life now and for the future, whether we notice it or not. "Everything has information at its core. So if information matters, then reorganizing the entire information network of the planet is like wiring up the brain of a two year old child. Suddenly that child can talk, think, act, and behave. The world is wiring up a cerebral cortex, if you will, of billions of connected elements that are going to exchange billions of ideas billions of points of knowledge, and billions of ways of working together." "Our planet is beginning to develop a nervous system, with each of us acting as human sensors." "Might sound interesting, might help you shed a few pounds, might make you realize you're eating too many potato chips and sitting around too much perhaps and that's useful to you individually, but if hundreds of millions of people do that you have a big cloud of data about people's behavior that can be crawled through by pattern recognition algorithm and doctors and health policy officials can start to see patterns that change the way collectively as a society we understand not just our health but every single area where data can be applied because we start to understand how we might collectively as a culture change our culture and behavior." "Everybody understands what it takes to digitize photography, a movie, a magazine, newspaper, but they haven't yet grasped what it means to digitize the medical essence of a human being. Everything about us now that is medically relevant can be captured with sensors we can digitize all of our metrics, and with imaging we can digitize our anatomy, and with sequencing of our DNA we can digitize our biology." "We have 6 billion data-points sitting in our genome that we've never had access to before. We're moving to a world where the patient is at the center of things and hopefully also at the controls." ​New year, new you. It’s 2018 and you’re ready to tackle running seriously. Shoes are bought, Garmin’s synced, you’re psyched. If running is part of your 2018 resolution, some planning and care should be put in place before getting started. Running is a skill that requires a capable musculoskeletal system to handle the demands placed on it over time. This post is geared towards runners who are getting started or coming out of retirement, although the concepts are important and can be applied to any experience level. This is an important piece that can be brushed off by beginners and veterans alike. What’s the point of warming up or cooling down if you’re just going out for a run? Well, lots of points. The cool-down, defined as a low intensity exercise of short duration, starts the recovery process and shouldn’t be neglected. A cool-down jog or walk also blunts the overshooting effects (increased contractility & hyperventilation) observed at the end of an exercise bout, and decreases relative cardiac load. Important for everyone, but especially if you have a known heart condition(1). The Run:Walk method is a tried-and-tested way to train for running that delivers improved fitness while decreasing the risk of injury. It should be the go-to method for anyone starting out, returning from injury, or even as a primary means of training. Jeff Galloway, creator of the Run:Walk Method, Olympian, coach, and author, trains and even competes in full marathons using a run:walk method. So - what is it? Simply put - it’s taking walk breaks during your run. For exmaple, a 3:1 run:walk would mean you run for 3 minutes, walk for 1 minute, and repeat. There’s genius in its simplicity. If you are just starting out or returning from injury, your body’s not ready to handle a sustained period of continuous running. If the biomechanical loads exceed what we are prepared for then we may increase our risk of injury(2). Your muscles have a chance to recover during each break, reducing collective fatigue and metabolic build-up. Decreases fatigue-related running form breakdown (dynamic knee valgus, overstriding, etc.). Reduces damage to the muscle (DOMS), speeding up recovery from one day to the next and creating a sustainable training model. Mental benefit: it breaks the run into achievable segments. It’s much easier to focus on your form and listen to your body when you know you have a walk break coming up in a couple minutes. The run segment becomes focused, purposeful, and quality. Below is a figure of Galloway’s Run:Walk. It fits a spectrum of abilities, from 7 min/mi runners to walkers. As mentioned previously, this is also a great model to incorporate when returning from injury. All of the same concepts and benefits apply. Return to run programming for injury is a little more specific in terms of dosage and progression/regression, but it all boils down to load management and building tissue capacity. Start with a duration that’s best for you. If you’re just starting out, try 15 minutes. Progression: the most important thing is to listen to your body. If you feel like the workload at X distance or ratio is starting to get too easy, it’s time to adjust. 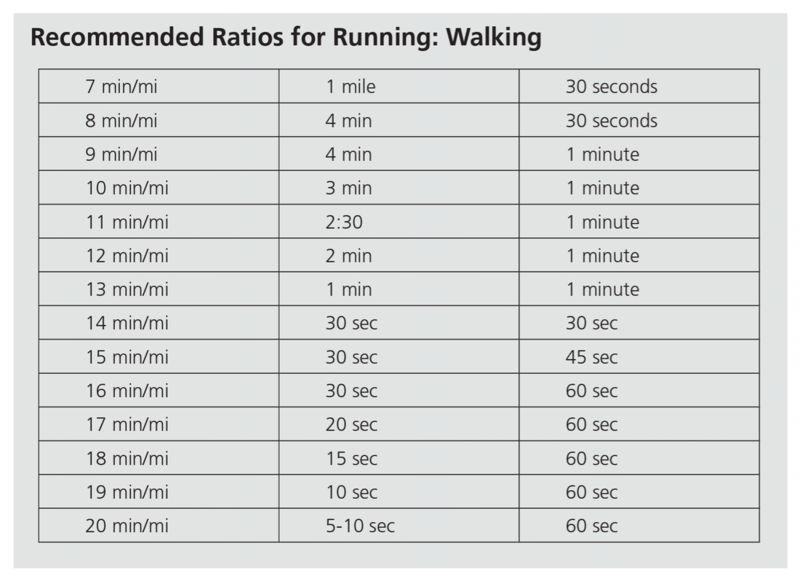 Stay at your target ratio (from the chart), and increase the total run time by ~5 minutes. After a couple months you should be feeling strong and confident. Don't forget to track your progress as fitness will happen, but not overnight! Tracking will help you realize how far you've come. Once you’re consistently run:walking every other day at volumes over 30 minutes you can start taking your training to the next level by putting together a specific training program. If you have specific questions about your training, fill out the form below. Lehman, Greg. “When Biomechanics Matters in the Management of Pain, Injury and a Bit of Performance.” Greg Lehman, 21 Sept. 2017, www.greglehman.ca/blog/2017/9/19/when-biomechanics-matters. Jeff Galloway. The Galloway Run-Walk-Run Method. The Galloway Run-Walk-Run Method. You’ve just completed your hill repeats. The workout went great, confidence is at an all time high, and you can’t wait to crush the next one. However… the next day you wake up and you’re stiff as a board. Your quads ache, your calves scream; you’re wondering what you did to deserve this torment. Exercise induced muscle damage and its corollary Delayed Onset Muscle Soreness (DOMS) often results from novel, intense exercise, and typically lasts 24-48 hours after the exercise, and subsides within 96 hours. DOMS itself is a mechanical disruption to the sarcomeres (the fundamental units of muscle cell contraction) that results in localized inflammation, swelling, and free radical proliferation of the muscle fiber(1). This lingering soreness and transient decrease in strength with DOMS has huge impacts for athletes of all abilities - you can’t practice or perform to your full potential if you’re sore! Traditional treatments (stretching, massage, ice, compression, etc.) have long been staples for DOMS amelioration with positive yet limited results; however one relatively new approach - tart cherry juice - is emerging as a promising alternative. A large aspect of the soreness we experience with DOMS is related to the inflammation, swelling, and free radical proliferation mentioned earlier. Tart cherries have been identified as a foodsource high in antioxidant and anti-inflammatory compounds, which has led researchers to speculate on their ability to alleviate inflammatory conditions. (2) Considering these potentially beneficial effects, researchers assembled a randomized controlled trial measuring pain, muscle tenderness, muscle strength, and relaxed elbow angle before and after a maximal bout of bicep curls. For the study, one group of subjects received 12oz bottles of tart cherry juice, the other group received a control drink (made to look and taste just like tart cherry juice) and were instructed to drink one in the morning, one in the evening, for the next 8 days. On day 4, subjects returned to the lab and performed their maximal bicep curl exercise session, which resulted in significant DOMS related soreness. Each of the following 4 days, the subjects returned to the lab and again measured pain, muscle tenderness, muscle strength, and relaxed elbow angle, and the data was gathered. The study found that for the control trial, strength loss was 30% at 24 hours and still 12% at 96 hours. In contrast, the cherry group strength loss was only 12% at 24 hours, and actually 6% above baseline measurements at 96 hours. Similarly, pain measurements in the control group increased until a peak at 48 hours, whereas the cherry group pain intensity peaked in only 24 hours. Measurements that did not show a significant difference between the groups included the resting elbow flexion angle and muscle tenderness. So what does all this mean? Although from this study it is not possible to definitively conclude that tart cherry juice supplementation prevented muscular damage/DOMS, it does seem to indicate a protective effect of the cherry juice and a preservation of muscle function. Less strength loss and decreased pain related to DOMS means you’ll be more fully recovered and ready to tackle that next workout at a higher quality level. Connolly DAJ, Sayers SP, McHugh MP. Treatment and prevention of delayed onset muscle soreness. J Strength Cond Res 2003;17:197–208. Tall JM, Seeram NP, Zhao C. Tart cherry anthocyanins suppress inflammation induced pain behavior in rat. Behav Brain Res 2004;153:181–8. Why do we need recovery days? I remember my dad asking me, driving on our way to high-school cross-country practice, why we had so many “easy” days. Why were only a few training days of the week spent really pushing ourselves, while the remainder of the week spent seemingly putzing around at a conversational jog. It was never something I’d really considered. We both grew up playing ball-sports, where it seemed every practice had the potential of sending you over to the sidelines gasping for air or heaving in the nearest trash-can. Running, however, was different, as it involved a delicate balance of training intensity, duration, and frequency. So - one must ask, is the distribution of hard days and light days really a self-organized optimum for endurance athletes, or a product of tradition and/or superstition?1 And, why can’t we train hard all the time? Stephen Seiler’s review(1) looking at training intensity and duration distribution in endurance athletes helps us tie what research is available to the mechanisms that might be at play. His paper demonstrated that the training characteristics of nationally or internationally competitive endurance athletes seem to converge on a typical intensity distribution in which 80% of the training sessions are performed at low-intensity (~ less than 80% VO2max), whereas 20% were spent at high-intensity (~ greater than 80% VO2max). From a macroscopic view, we can use Banister’s(2) (sorry, not Roger Bannister) “Fitness-Fatigue” model to see why this might be the case. Training (intensity, duration) and recovery (rest interval, nutrition) variables interact to induce both fitness (i.e. positive physiological adaptations), and fatigue (i.e. stress response and associated negative health outcomes) affects. The fitness after-effect presents as dull in magnitude, but long in duration, and manifests as a long-term improvement in performance, while the fatigue after-effect is initially large in magnitude with a brief duration. 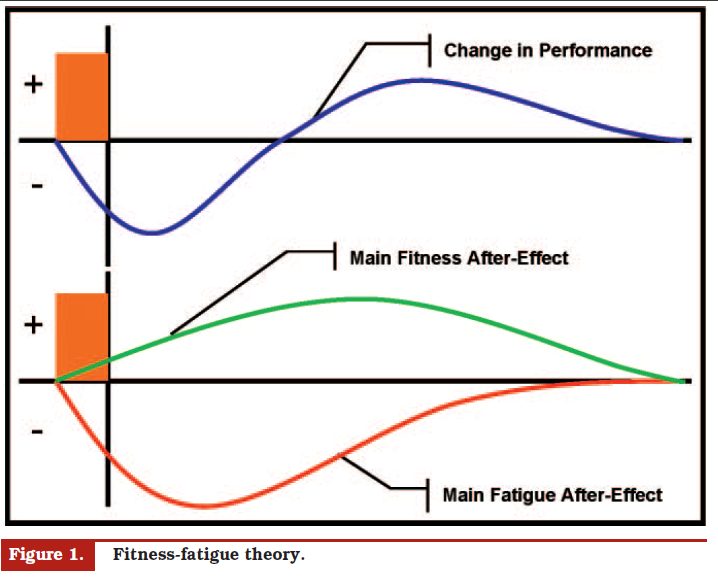 The model may be best illustrated by the figure below, showing that as the duration of the fitness after-effect is longer than the fatigue after-effect, a period of recovery allows the fatigue to diminish while fitness remains high. Conversely, stressful periods of training without sufficient recovery results in an accumulation of fatigue and an increase in the systemic or main fatigue after-effect. If you have ever trained for an endurance event, you don’t need a theoretical model to tell you that 7 days of high-intensity workouts in a row isn’t a good idea. This is because our bodies need time to recovery so that we can maximize the benefits from our most recent hard session. Think of endurance training, light days and hard days, simply as a stimulus for adaptation. More microscopically, the magical 80-20 intensity distribution strategy may be ideal for optimization of cellular adaptive signals and stress responses within the body. Positive adaptations with endurance training include higher mitochondrial density, higher capillary density, greater enzyme density/function, and more, which help improve VO2 among other markers and functionally improve performance(3). Cellular signaling studies are continuing to emerge, but some key takeaways might include that: 1) exercise duration and intensity can drive gene expression for positive adaptations, and 2) ceiling effects for signal amplitude are seen rapidly with repeated high-intensity interval exercise, whereas increased frequency at low-intensity may provide greater scope for expansion of the total signal for gene expression (greater overall effect)(1). So - the body needs “lighter” recovery days to maximize the positive fitness effects that occur with our “heavier” training. This balancing act of exercise intensity, duration, frequency, and internal individual factors (life stress, work stress, nutrition, sleep habits, etc), is what makes coaching such an art. Like most things, the traditional model of 80-20 intensity distribution is something coaches have known forever, it’s just now that research is starting to catch up. Seiler, Stephen. "What Is Best Practice for Training Intensity and Duration Distribution in Endurance Athletes?" International Journal of Sports Physiology and Performance (2010): 276-91. Human Kinetics, Inc. Web. Banister EW, Good P, Holman G, et al. Modeling the training response in athletes. In: Landers DM, ed. Sport and elite performers. Champaign: Human Kinetics; 1986:7–23. McArdle, W.D., F.I. Katch, and V.L. Katch. Exercise Physiology: Energy, Nutrition, and Human Performance. Baltimore: Williams & Wilkins, 1996. Seiler S, Haugen O, Kuffel E. Autonomic recovery after exercise in trained athletes: intensity and duration effects. Med Sci Sports Exerc. 2007;39:1366–1373. FS Routledge, TS Campbell, JA McFetridge-Durdle, SL Bacon. Improvements in heart rate variability with exercise therapy. Can J Cardiol 2010;26(6):303-312. Fluck M, Hoppeler H. Molecular basis of skeletal muscle plasticity–from gene to form and function. Rev Physiol Biochem Pharmacol. 2003;146:159–216. Core Stability & Pain: Is it time to stop using the word stability to explain pain? Purpose: To cherry pick a few research articles to suggest that even though our knowledge of core stability is very impressive its link to pain is poor. Nutshell summary: People in pain have spines that function differently than those not in pain. Many treatments can influence pain. The spine stability model of low back pain does not explain how people have pain and takes an overly mechanical view of the pain experience. No test has ever shown that a spine is unstable or how "increasing stability" would lead to a decrease in pain. Thinking that our spines need more stability or control may be the completely wrong path in explaining how people have pain or how our exercises help them. Our treatment "corrections" occur not via one specific "corrective" mechanism (e.g. improving stability) but rather through global non-specific mechanisms that our better explained by our understanding of pain neuroscience. Making the shift from believing that "stability" is the issue with pain can thus free up to choose completely different exercise programs. Exercise and treatment prescription thus become simpler. We have preliminary evidence to support this view with the clinical studies that show benefits with the various exercise conditioning programs that train different schools of thought on stability or the just as effective programs that completely ignore any concepts of stability. Some content from the intellect of others. An archive of sorts to help me (and you) sort through this world of rehab, performance, & health. If any citations are missed, please let me know. It is my full intention to give credit where due. Want a question or topic covered?